I don’t claim to be a trend-setter. I’ve been late to the party with everything from raw buckwheat groat cereal to green smoothies. Raw kale salad is the next recipe on that list. I only wish I had started making (and eating) this ages ago. Using the ANDI score system for nutrient density developed by Dr. Fuhrman and used by Whole Foods market, kale and collards share the #1 spot. Even though nutrient density is really important to me, I gotta be honest: if I don’t like how it tastes, I ain’t gonna eat it. Or, at least, I’m not going to be happy about it. But, this recipe for kale salad make me happy. Hence, the name, Strangely Addictive Almond Butter & Kale Salad. For the record, I was inspired by Chef AJ’s Hail to the Kale salad recipe. You can watch the video on YouTube here. I made my salad following her recipe the first time, but I found it to be a bit too rich and salty. So, I adjusted some of the ingredients and proportions to lighten it up a bit without compromising the addictiveness, I mean, flavor. To make my life even easier, I used a 10 ounce bag of pre-washed kale from Trader Joe’s. You could use one large bunch of curly kale if you prefer, but you’ll need to wash the leaves and dry them well before adding the dressing. The deliciousness of this particular recipe comes from the combination of sweet and sour/salty. At this point, I could eat it every day. Another key element is using scissors to work the dressing into the leaves. This helps tenderize the kale while ensuring each leaf is well-coated. Combine all ingredients except kale in a high-speed blender and whirl until smooth. 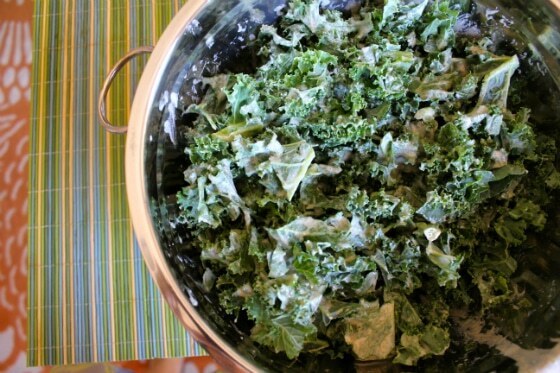 Pour over kale leaves in a large bowl and use scissors to chop the dressing into the leaves. Continue until leaves have softened and dressing has fully coated all of the kale. Do you have any variations of kale salad that you make? Do you love it as much as I do? This should come as no surprise. I love kale salad! I love massaging kale in tahini. So simple and so tasty! This would be good with tahini too in place of the almond butter! I’m not sure if it would be as sweet though. True. A dab of agave or coconut nectar would probably be a necessary complement. Kale is one of my absolute favorite vegetables…in any form. This looks great! I also love tahini on salads—I usually put all my ingredients in a tupperware with a lid and then just shake it really hard so everything mixes and coats. The sweet, salty, bitter mixture is SO good! I’ve been making a kale salad that’s just dried cranberries, sliced almonds, red onions, olive oil and lemon juice. I massage the kale with the dressing. It’s so simple and good. I’ll try yours next! Thanks Cathy! I’ve tried a kale salad with those flavors, too and it was delicious. This one has the sweetness of the almond butter and I can’t tell you how much I like it. Let me know if/when you try it! thanks for both ideas. I never made it at home but I have tried several versions at restaurants. A comment: try NO to use kale (or anything) in PLASTIC bags. Not because there is something bad to the vegetable but because of the ENVIRONMENT. I read about the terrible problem that we humans are creating by using pre-washed vegetables in plastic bags or containers. You may want to look into it and its consequences to the environment. 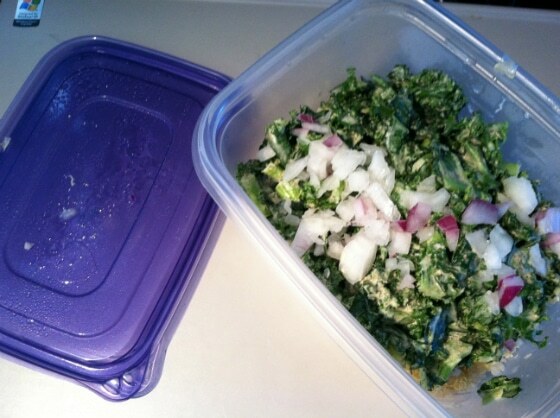 I used to use the pre-washed salad in plastic containers… not anymore. I went back to the “good old days”: wash your food and eat organic (and less). Besides, washing your vegetables and fruits yourself creates a connection between you and your food. It is nice. Again, thanks for the ideas! I will try them at home. We just made this tonight – we omitted the vinegar and hemp seeds as we didn’t have any – and it turned out awesome! The dressing is amazing. Our 8 year old daughter even loved it and ate a whole bowl. Oh thank you so much for letting me know! It’s so nice to know that there are parents out there feeding kids wholesome, health-promoting foods. I get a little discouraged sometimes reading about what a lot of kids are eating these days and their resulting health problems. Good job!!! Thanks Ginny! I can’t remember if I replied to your comment or not. I’m glad the commenting feature is working for you again. Let me know if you make the kale salad, it is soooo yummy and I’d be curious to know if your daughter likes it, too. It seems yummy! I almost don’t dare to express it, but I never had kale before. We’re probably going to grow some in our garden. Kale has to be prepared right otherwise I don’t like it. In fact, the only way I can eat it is blended into a fruit smoothie or mixed with another strong flavor like the almond butter dressing. This recipe sounds amazing. I like to massage kale with avocado and add a little lemon juice, and then top with veggies. That’s good, too, but I bet not as good as this. I also like to make kale chips (tahini, garlic, lemon) in my dehydrator. Those are addictive! Can I ask…? What do you mean by “using scissors to work the dressing into the leaves”? I always use my hands to massage my kale when making kale salads. Made it last night – didnt have dates or hemp seeds on hand. Added ground flax in place of hemp. Really good!! Enjoyed it. Thanks for sharing this recipe! This is the third time I have made this salad…I absolutely love it! Thank you so much for sharing such delicious and nutritious recipes, Carrie! Forget the salad – the SAUCE! I can just eat it. Mmmm… the first time I made it according to the recipe and it was heavenly; the second time I made it, I started with almonds and no hemp seeds as I’d run out of both almond butter and hemp seeds, and added a bit of sesame oil for an Asian touch. Equally as delish. Thank you!! No kidding Annette, I could eat just the dressing, too! Chef AJ suggested making kale chips with this dressing which I have yet to try but I think would be wonderful. 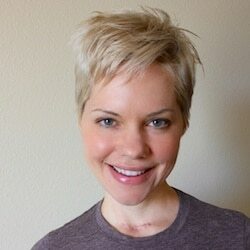 Hi Carrie- I am new to your blog but I LOVE it so far. I made this over the weekend and I thought it was sooo yummy but it made a ton of dressing despite the fact that I cut down the Almond butter and even subbed some of the AB with tahini. I had no other kale on hand so I added shredded carrots and raw beets in. Colors were amazing. Next time I will add the dressing as I go along and adjust it accordingly. One quick question – what is the difference between your Vitamix and your juicer? Also what type of Vitamix do you have and why? I am looking for one but they have so many different versions and I was not sure. Thanks! Sounds yummy! My favorite way to eat kale is to steam it with zucchini and serve it over warmed quinoa and garbanzo beans with Bragg’s Liquid Aminos..I could eat it every single day, so good! I know this is an “oldie”- but I wanted to let you know that I made it for a church gathering and had several requests for the recipe from non-vegetarians! It’s SO good! This is awesome! I found it to be SUPER garlicy though. I would definitely reduce the garlic.